Would you ever expect to graduate from high school only to return a few years later as a teacher? Mater Dei alumnus and Yearbook Moderator Alexis Villa certainly did not, but that’s exactly the situation he found himself in when he graduated from Chapman University with a film degree and a fuzzy vision of his future. Villa graduated Mater Dei in 2006, and is currently in his second year teaching at the high school. 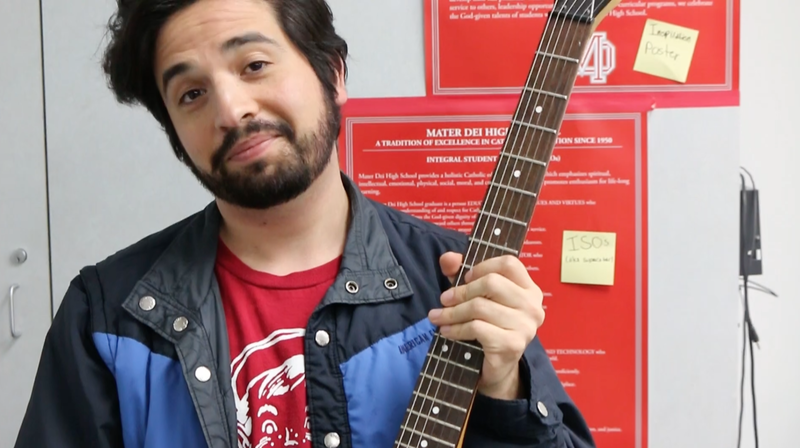 He’s famous around campus for banging on his drums, inviting students to play guitar, holding “Vinyl Parties,” after school and orchestrating a lot of pleasant noise in the 200 wing hallway. Unfortunately, due to space issues in the classroom, he was asked to remove his drum kit, but one sole guitar remains. Villa encourages people to be creative and takes pride in his homey classroom that serves as a safe space for students to express their artistic individuality. An artist himself, Villa plays the guitar in his instrumental metal band Sonoran Desert Toad on the side of his teaching career. He takes pride in his artistic versatility but maintains teaching as his first priority.